I have long been a fan of Tibi and one of my favorite pieces is the cami below below. Every season their classic cami stays the same but the prints and materials it's made out of evolve with the trends, i.e. the leather version, chiffon or color-blocked satin. My personal taste usually means wearing this tank with a blazer and some skinny denim and what is better then adding some leather elements like that fab blazer below. 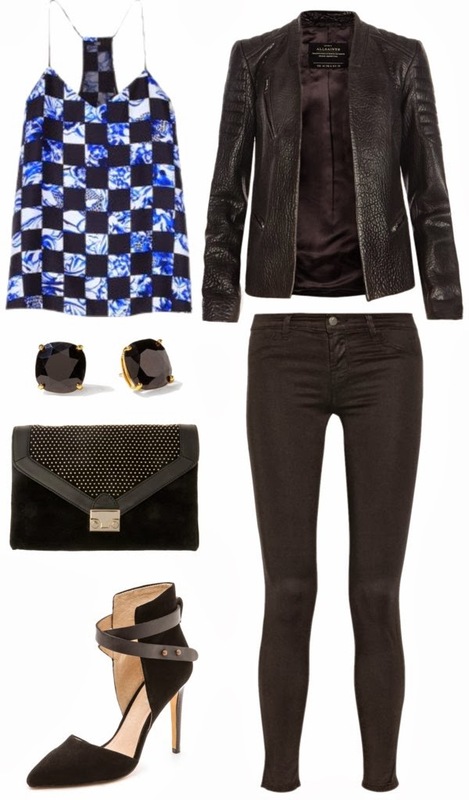 I love the sleek look of black with the burst of the cobalt print to give the ensemble a little more pop. I think the pairing below is perfect for a date night or evening on the town with your gals. Get in my closet!